There&apos;s well over a year until Wisconsin&apos;s next gubernatorial election, but the race for governor is already heating up. Republicans already have two candidates planning to run for governor in 2010. 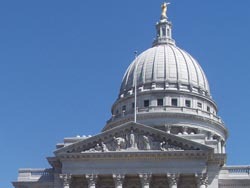 Former Congressman Mark Neumann announced last week that he plans to seek the GOP nomination and Milwaukee County Executive Scott Walker plans to tour the state Tuesday for a "special announcement" on his plans for higher office. UW-Madison political scientist Charles Franklin says it&apos;s not surprising to see campaigns already underway on the Republican side. With no control of the Legislature or the Governor&apos;s office, he says they have a greater incentive to raise their visibility now. Don&apos;t expect heavy campaigning in the near future though. Franklin says the media blitz will likely wait until next summer. He doubts the campaigns would have the resources necessary to sustain 18 months worth of campaigning, unlike the recent presidential election. On the Democratic side of the race, Governor Jim Doyle has not said yet if he will seek a third term in office, even though he is expected to run again. Franklin says there&apos;s no reason for Doyle to announce his plans this early, since he&apos;s not likely to face any opposition from within his own party.